Often dubbed the ‘Mandela of the Maldives’ Mohamed Nasheed was the Maldives’ first democratically elected president. He remains a figurehead for the promotion of human rights and democracy in Islamic countries, and an international icon for action against climate change. A former human rights activist, Nasheed led a campaign of non-violent, civil disobedience that pressured the dictatorial Maumoon Gayoom, then Asia’s longest-serving ruler, to relax authoritarian controls and allow political pluralism. In historic democratic polls in 2008, Nasheed was elected president, sweeping away 30 years of one-man rule. Arrested, imprisoned and tortured in the Maldives on numerous occasions for his political beliefs, Nasheed was named an Amnesty International “Prisoner of Conscience,” and is widely credited for playing an instrumental part in bringing freedom and democracy to the Maldives. During his time in office and thereafter, Nasheed has played a prominent global role advocating for action to curb greenhouse gas emissions that threaten his nation. In 2009, to highlight the Maldives’ vulnerability to rising sea levels, Nasheed famously held a meeting of his cabinet underwater. Nasheed also implemented policies to turn the Maldives into the world’s first carbon neutral country by 2020. 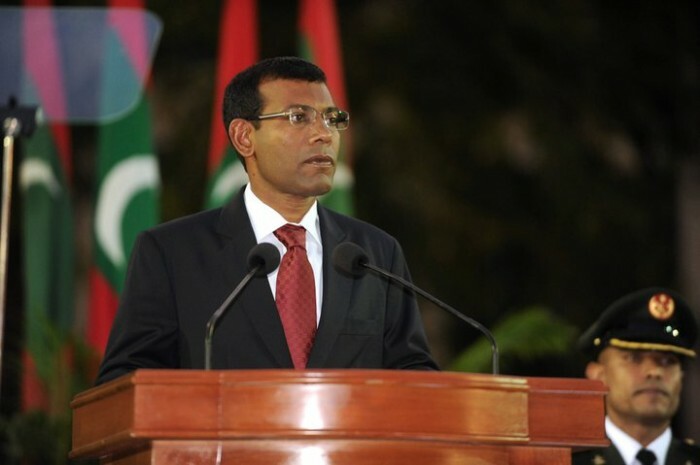 On 7 February 2012, democratic progress in the Maldives suffered a major setback when Nasheed was forced to resign the presidency under the threat of violence, in a coup d’etat perpetrated by security forces loyal to former president Gayoom. Nasheed narrowly missed out on re-election for president in late 2013, losing the presidential run-off by less than 3%. The election was marred by repeated interventions, delays and vote cancellations by the Supreme Court, which was accused of conspiring with Nasheed’s political rivals to prevent his return to office. President Nasheed was elected the President of the Maldivian Democracy Party in August 2014. President Nasheed won the 2009 Anna Lindh Prize, in recognition of his work promoting human rights, democracy and environmental protection. In September 2009, Time Magazine declared President Nasheed a ‘Hero of the Environment’. In April 2010, the United Nations presented Nasheed with its ‘Champions of the Earth’ environment award. In August 2010, Newsweek named President Nasheed in its list of ‘World’s Ten Best Leaders’. In 2012, The Island President, a documentary feature film about Nasheed, was released in theatres worldwide. In June 2012, Nasheed was presented with the James Lawson Award for the practice of non-violent action.